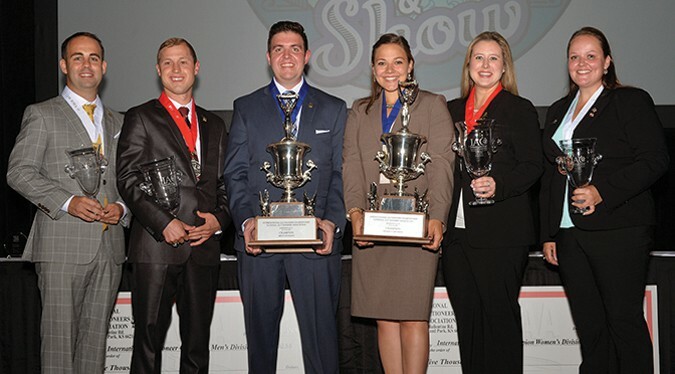 JACKSONVILLE, Fla. (July 20, 2018) – Emerging from an overall field of 77 competitors, Barrett Bray, of Edmond, Oklahoma, and Emily Wears Kroul, of Solon, Iowa, were crowned as winners of the Men’s and Women’s National Auctioneers Association 31st International Auctioneer Championship, which took place Friday at the Hyatt Regency Jacksonville Riverfront. Bray, AMM, BAS, and Wears Kroul, CAI, ATS, BAS, received a $5,000 cash award, trophy and championship ring for their winning efforts through the preliminary bid-calling round, an interview round consisting of three questions, and a final round of bid-calling that included the top 15 men and seven women. In the two divisions, 62 men and 15 women competed for the right to be known as one of the best auction professionals in the world. For Bray, the championship comes in his very first NAA IAC competition. The lack of event experience didn’t slow him down, however, as he handled each on-stage moment with veteran composure from start to finish. 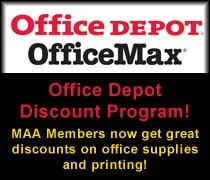 A first-generation NAA auction professional, Bray launched his own company, Bray Auctions, in Oklahoma City, Oklahoma. He is also the current Oklahoma state auction champion. Behind Bray, Eli Troyer, of Beach City, Ohio, finished as runner-up, and Jay Cash, of Murfreesboro, Tennessee, rounded out the top three as second runner-up among a stout group of 15 men’s finalists. A former champion in Iowa (2009), Colorado (2012), and Wyoming (2014), Wears is a second-generation NAA auction professional. 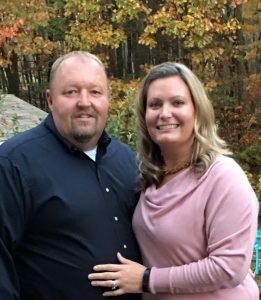 She works full time in the family business, Wears Auctioneering, with her dad, Brent, and handles all online auctions as well as onsite auctions on weekends. Emily is an auctioneer on A&E’s reality show “Storage Wars”. Morgan Hopson, CAI, of Oklahoma City, Oklahoma, took runner-up, a strong follow-up to a second runner-up showing in the 2017 NAA IAC. Laura Mantle, CAI, CAS, was second runner-up to complete the top three and put the wraps on a fiercely competitive women’s field including seven finalists. Also during the IAC competition, which was streamed live throughout the day on Facebook Live (with a reach of just under 25,000 who saw it or stopped by the feed) and YouTube, the Chuck Cumberlin Sportsmanship, awarded to the IAC competitor who shows the best sportsmanship, was given to Jerick Miller, of Cambridge, Ohio. The Bob Steffes Rising Star Award was given to Katie Imholte Gabriel, BAS, of St. Louis Park, Minnesota. Both the 2018 NAA IAC and 2018 NAA IJAC were conducted as part of the NAA’s 69th Annual International Auctioneers Conference and Show, which took place in Jacksonville in July. IAC contestants must be 18 years of age or older, a current NAA member, and registered for Conference and Show. 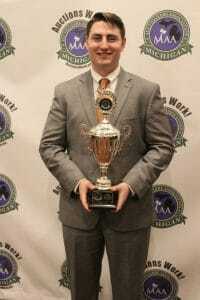 Frankenmuth, Michigan – Clayton Neal of Tiffin, Ohio won the title, Michigan Auctioneer Champion at the Michigan Auctioneer Championship. 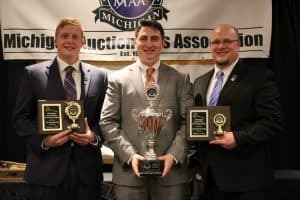 The Championship was held on February 1 at the Michigan Auctioneers Association Annual Conference held at the Bavarian Inn located in Frankenmuth, Michigan. 17 Contestants competed for the coveted title. The 5 Finalists were Ridge Bollheimer (Clarklake, Mich.), Grant Cole (Beulah, Mich), Clayton Neal (Tiffin, Ohio), Billy Peyton (Middletown, Ohio), and Dan Troyer (Dalton, Ohio). 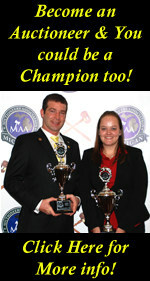 For winning the title, Clayton received a championship ring, trophy, and entry into the International Auctioneer Championship in July in Jacksonville, Florida. Also taking home honors were Billy Peyton and Grant Cole. Peyton was the 1st runner up and Cole was the 2nd runner up. 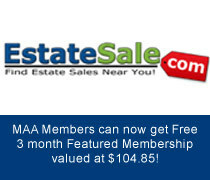 Clayton is a first generation auctioneer licensed in Ohio. He is a full time Realtor selling residential, commercial, recreational and agricultural real estate. He also sells livestock, farm machinery, antiques, estates and benefit auctions. In 2013, he graduated from The Reppert School of Auctioneering located in Indianapolis, IN. Clayton was also named the 2014 Ohio Junior Division Champion. 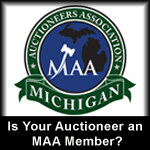 Clayton is a member of the Michigan and Ohio Auctioneers Associations, as well as the National Auctioneers Association. He is just a short distance from the Michigan border with the ability to work both in Ohio and Michigan. 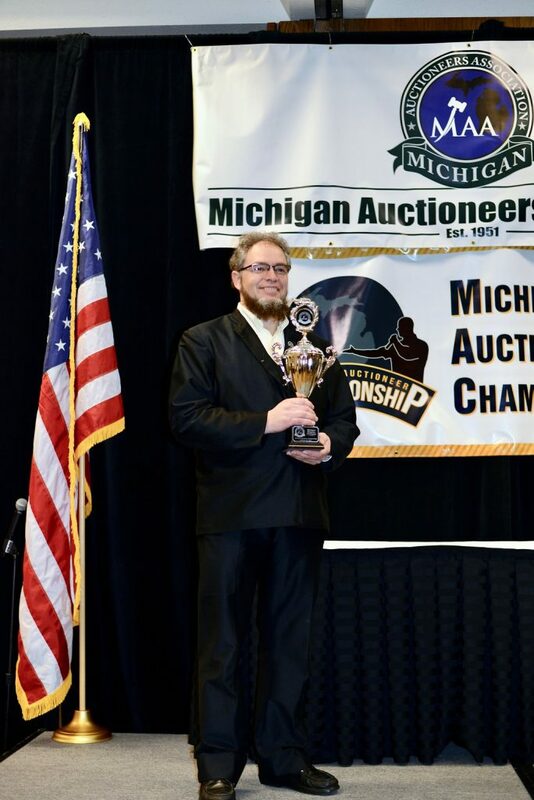 His journey started this past June with encouragement from the 2017 Michigan Auctioneer Champion, Eli Troyer. 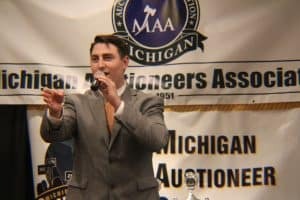 In those 9 months leading up the Michigan Auctioneer Championship, Clayton focused on positive encouragement and the dream of being a full time auctioneer. The amount of personal growth during this time was instrumental in providing both maturity and a new positive outlook on our mission here on Earth. 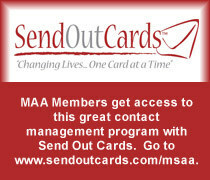 Welcome to the MAA’s eGavel! Check out the 2017 Summer eGavel! 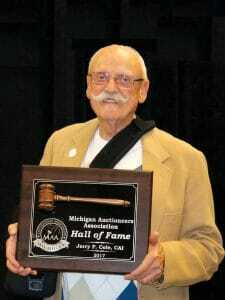 Traverse City, Michigan – Auctioneer Jerry Cole of Beulah, Michigan, received the highest possible honor any auctioneer can receive, by being inducted into the Michigan Auctioneers Association Hall of Fame. After he and his family moved back to Michigan, his wife, Mary Jo, was working at a local hospital and he spent his time refinishing antiques and selling them in antique shops. Auctions were the hot topic at the local antique shop. Jerry was intrigued, so in 1990, he and his friend decided to go to Reppert School of Auctioneering. He found out quickly that being a first generation auctioneer, he was going to have to ask for help. 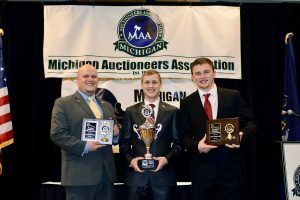 Joining the Michigan Auctioneers Association proved to be the most beneficial tool to becoming a professional auctioneer. He learned quickly from other auctioneers and made lifelong friends. 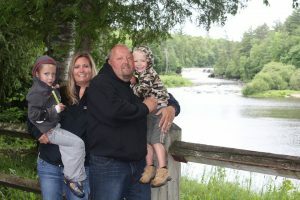 After his family moved to northern Michigan, he grew his business and planted its roots, including building an auction house, conducting estates and consignment auctions throughout the year. Each year saw growth in his business and he always reinvested back into education and technology. His son, Grant, joined the business early on and runs it to this day, now specializing in Sports Collectibles. Grant’s two children, Harper and Wyatt, are also growing up in the business. His young daughter, Harper has already spent some time on the microphone calling bids. Jerry earned his Certified Auctioneers Institute(CAI), Accredited Auctioneer of Real Estate (AARE), and Graduate Personal Property Appraiser (GPPA) designations. He has been a successful auctioneer for over 20 years and has conducted over 1000 auctions in his career. He has sold everything from antiques to real estate, benefit auctions to local 4H and Boy Scout Fundraisers, and everything in between. Jerry gave back to the association he loves by serving on the MAA Board of Directors and serving as the MAA President in 2001. 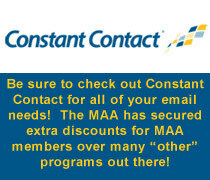 As soon as the program was offered, he committed to the MAA by becoming a Life Member. 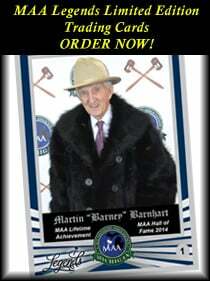 He has a passion for the auction profession and the MAA holds a special place in his heart. Traverse City, Michigan – Auctioneer Willis Yoder of Shipshewana, Indiana had a great weekend at the Michigan Auctioneers Association Annual Conference in Traverse City. He was awarded the honor of the 2017 Michigan Ringman Champion on January 20 at the Michgan Ringman Championship. A field of 7 contestants from Michigan, Indiana and Ohio entered the competition. Also taking home honors were Eli Troyer and Kelly Merryman. Troyer was the 1st runner up and Merryman was the 2nd runner up. 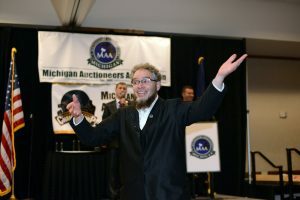 The next evening, Willis received the highest possible honor any auctioneer can receive, by being inducted into the Michigan Auctioneer Hall of Fame. As a boy growing up on a dairy farm in central Michigan, one of the highlights was going to the major draft horse sales and listening to some of the country’s top auctioneers. This inspired him to go to Reppert School of Auctioneering in 1991, where he earned his diploma in auctioneering. It was also common to hear him practicing his auction chant in the silo at chore time where no speaker was needed, or on the plow every time you passed a fence post it was another bid. After returning from auction school he contacted a local auction barn asking if they could utilize his help if he would donate his time. They accepted the offer. He would head out on his bicycle and pedal the 25 miles to the auction, work the ring until 7 p.m. and was called to the auction block where he sold until almost midnight. And sure was grateful to hitch a ride home with a friend, saving a 25 mile midnight ride. He was also instrumental in getting his little brother excited to attend Reppert School of Auctioneering in 1993 and becoming a member of the M.A.A. And in 1994, formed Yoder Brothers Auction Service. Their first auction was their dad’s farm auction in April of 1994 with 40 head of dairy cattle, draft horses and farm machinery. They now conduct a huge consignment auction twice a year with farm machinery and misc. outdoor being a two day auction event with four auction rings selling both days, attracting 1500 to 2000 bidders in two days. The horse and carriage auction is held on the first Saturday in May with approx. 300 head of horses and 100+ carriages. In 2003, seeing a need and opportunity for custom built cashiering trailers and auction toppers he was the founder and co/owner of Kuntry Custom R.V. Cashiering Trailers and Auction Toppers. And currently designs and builds various sizes of aluminum frame portable auction podiums along with his walnut auction gavels. Willis currently can be found selling at Shipshewana Antique Auction every Wednesday. 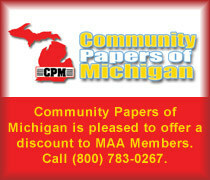 And helps little brother with the larger auctions and consignment auctions in Michigan. He also works as a contract auctioneer for other auction companies. Willis is also the 2012 Super Summer Slam Down Bid Calling Champion, the 1997 Michigan State Auctioneers Association Bid Calling Champion, the 2004 and 2005 Indiana State Reserve Champion, a 2 time finalist in the International Auctioneers Championships, and the 2011 Pennsylvania Dutch Bid Calling Reserve Champion. He is a past MAA director, a 2002 graduate of the Certified Auctioneers Institute, and a 2011 Graduate of the Professional Ringman’s Institute. He has been involved in more than the auction side of the auction business, building cashier trailers and truck toppers. Currently, in addition to conducting auctions, he supplies several different types of auction podiums to the auction industry. He loves to hunt, fish, go camping and ride horses. Willis lives in Shipshewana, Indiana with his wife and five children. 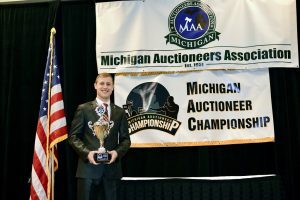 Traverse City, Michigan – Eli Troyer of Applecreek, Ohio won the title, Michigan Auctioneer Champion at the Michigan Auctioneer Championship. The Championship was held on January 20 at the Michigan Auctioneers Association Annual Conference held at the Grand Traverse Resort and Spa in Acme, Michigan. 13 Contestants competed for the coveted title. The 5 Finalists were Ridge Bollheimer (Clarklake, Mich.), Grant Cole (Beulah, Mich), Frank E. Leist (Petoskey, Mich.), Eli Troyer (Applecreek, Ohio), and Scott Vander Kolk Jr (Dorr, Mich.). 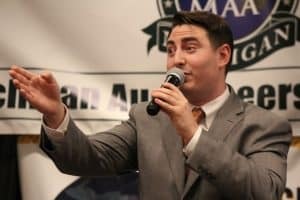 For winning the title, Eli received a championship ring, trophy, and entry into the International Auctioneer Championship in July in Columbus, Ohio. Also taking home honors were Grant Cole and Ridge Bollheimer. Cole was the 1st runner up and Bollheimer was the 2nd runner up. Eli Troyer is a full time Auctioneer/Real Estate Salesperson. Licensed in Ohio, Pennsylvania & West Virginia. Eli sells Residential, Commercial, Recreational and Agricultural Real Estate. He also sells Equipment, Livestock, Automobiles, Antiques, Estates, & numerous types of Business liquidations across these states and Michigan. Graduating from the Ohio Auction School in 2013, Eli is also the 2016 Ohio (Jr Division) Champion. 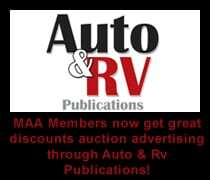 Furthermore Eli is a member of the (NAA) National Auctioneers Association, (OAA) Ohio Auctioneers Assoc., (MAA) Michigan Auctioneers Assoc., and (WVAA) West Virginia Auctioneers Assoc. Eli is 3rd generation in the auction business, but a 1st generation auctioneer and lives in Applecreek, Ohio. Eli enjoys business and is very passionate about the auction business. He also loves being around people and building relationships. In his spare time you can find him doing outdoor activities, helping out at church or spending time with his wife. 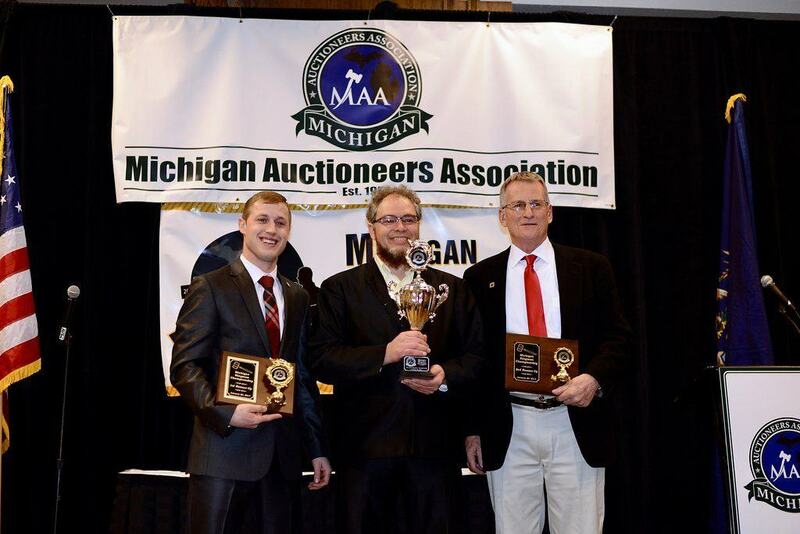 Eli is humbled and honored to be named the 2017 Michigan Auctioneer Champion. He looks forward to representing the Michigan Auctioneer Association at the 2017 NAA Conference and Show in Columbus in July. Chuck’s father, Jim started in the auction business in 1973, working in the Nashville, TN area for several years. Jim worked in and out of the auction business for several years. He moved to Michigan, where he worked for Don Brink at Hamilton Auction Company with Tom Wiltjer, Tricia Wiltjer’s father. He also helped Sid Miedema for several years. After leaving the industry again, he knew his passion was the auction industry and came back to work for Sid and Scott Miedema in 2002, where he has been ever since! Chuck’s previous work career ranges from tow truck driver and mechanic, to service manager, and tire shop owner. 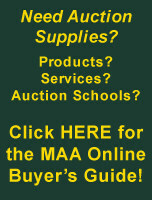 In 2004, Chuck was introduced to the auction business when he was hired by Miedema Auctioneering to set up auctions. Chuck set up auctions for about 4 years before he decided he wanted to call bids. Scott Miedema bought him some tapes and books and told him to start practicing! Chuck had just begun practicing and getting the hang of things, when Hib Kuiper and Doug Heuker put him on the spot at an auction. He had no choice but to call the bids when Hib and Doug dropped the microphone on the ground, told him it was his turn, and walked away! Chuck has been a full time auctioneer and ringman ever since. Chuck’s knowledge and experience gleaned from prior jobs helped to make him a well rounded, knowledgeable auctioneer. Chuck specializes in live auction events consisting of construction equipment, industrial equipment, farm equipment and real estate. Chuck has traveled across the U.S. providing critical leadership and management of many high profile auctions, liquidating millions of dollars of assets. Chuck also devotes his time to charity events, calling bids at benefit auctions about 10-15 times per year. Much of Chuck’s success has come not only from his dad, but also Doug Heuker, Hib Kuiper, Sid Miedema and Scott Miedema. Not only did they give him the opportunity, they kept encouraging and believing in him. Chuck and his wife, Shannon, have been married for 10 years. They have two boys who love to wear Miedema Auctioneering clothing and match their dad. Dylan is 8 years old and Max is 6. When they are not working, they enjoy camping and spending time with family. If you have any questions or concerns regarding the association, please contact Chuck Ranney (616) 560-0839 or chuck@1800lastbid.com.